500 sq. 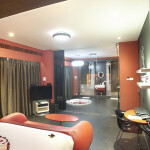 ft. with 2 balconies and an in-room Jacuzzi – is located on the Ground Floor and does not offer any view. For couples only. Outfitted with its very own private jacuzzi, this suite certainly lives up to its name. And you can further set the mood with a choice of different light settings allowing you to create your own indoor fantasy.